Almost every time I go to San Francisco, I dine at Neptune’s Palace. 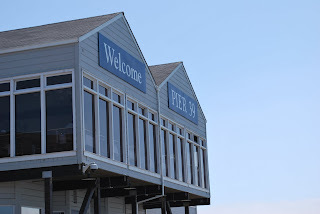 In fact, when I am doing the touristy things at Pier 39 and Fisherman’s Wharf, I’ve only eaten at a different restaurant one time…every other time it’s been Neptune’s. This time, there was a slight wait to get seated, although the restaurant wasn’t crowded. Once seated, we had a table with a good view, although all of the tables at Neptune’s have a view of the Bay due to the restaurant design, some are closer to the windows than others. Since the last time I ate at Neptune’s Palace, they changed the menu a little bit (if you look online, they still have the old menu posted.) The fresh fish selection used to come with vegetables and jasmine rice with a citrus beurre blanc. Now it comes with garlic mashed potatoes and something I don't remember. I really loved the rice and the citrus beurre blanc., I wasn’t really feeling like eating salmon, since I’d had some sole the night before. So, this time I chose to get the split prawns, which came with a wild rice pilaf and grilled vegetables. The shrimp, vegetables, and rice were excellent. Unfortunately, I was so hungry, I couldn’t wait to eat…so didn’t take any pictures of the food. We also ordered the shrimp bruschetta appetizer; it was $8.95 for three pieces of bruschetta topped by chopped shiitake mushrooms, sun dried tomato tapenade, lemon aioli and shrimp. It was served with a garnish of greens with a tasty gingery-sesame tasting dressing…in fact, I think I liked the greens and dressing better than the bruschetta, although the bruschetta was quite good. Normally, when I’ve eaten at Neptune’s Palace, the service was excellent, but I think they must’ve been short-handed, because it took quite some time to get the bread basket. The overall food service was very slow, however, the food was definitely worth it. During the last week I've looked for information about or something related,until for a stroke of luck I found your page, where I get the information what I was looking for. I was scared about quantity of buy viagra blogs that I had to evade to find the correct site.